Manufacturer of Electronic, Electrical Products Accessory. Our DIN Rail Power Supplies are used by electric machine and battery charger appliances. With the rigid and compact appearance plus DIN rail / wall bracket mounting, our DIN Rail Power Supplies are saving space and industrial application. 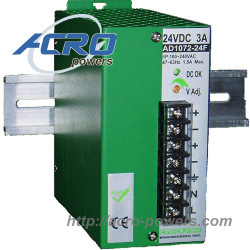 As universal power supplies, they supply output 100 W. The devices are available with output voltage 12, 24, and 48VDC. They have a high efficiency up to 82%. Every model has built-in power ready signal and O-ring diode for redundant application, and over voltage, overload and short circuit protections.